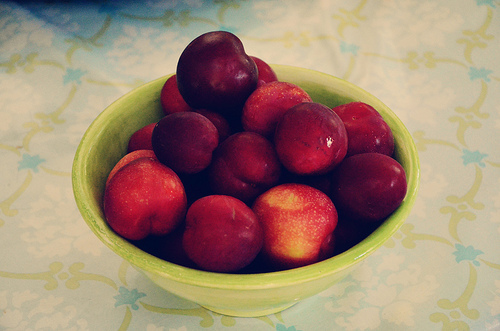 Easy plums from our trees…benign neglect never tasted so good. True story: While chatting in a group setting a few weeks ago, a friend brought up the subject of frying her food and which oils are best for frying. She was talking about chicken, and I am Southern. She was bemoaning the price of olive oil and then someone brought up canola oil. Because I Know Everything, I jumped right in: “When deep frying anything, you should just use straight vegetable oil because it has a high smoke point and a neutral flavor and it’s not too expensive. The flavor will be best the second or third time you use it, but don’t use it many more times than that because the smoke point lowers pretty quickly. But don’t use canola because it’s a GMO, and unless you’re buying pretty close to the source for your olive oil, it’s hard to be sure it’s 100% olive….” And then someone — in a nice way — told me to put a sock in it and further explained that vegetable oil also contains GMOs and can contain many different oils, some of which are from areas that are being exploited. I haven’t researched her claims because, frankly, I just can’t. I have reached Ethical Eating Fatigue, people. And I bet you have, too. There is a list as long as my arm concerning the health and ethical grey areas surrounding the food on our plates, and it’s enough to overwhelm a person. Off the top of my head: Pesticide usage poisons the farmers, the laborers, the ground water, the wild animals, and is causing colony collapse, and who knows what else. Growth hormone and antibiotic use in livestock is causing early puberty in children. Groundwater runoff is causing e. coli outbreaks. Monocultures are going to lead to another dust bowl. Palm oil (which is in everything) is causing the destruction of the rainforest and gorilla populations. GMOs are going to kill us all. Honey isn’t actually honey. Olive oil isn’t actually made from olives. Chocolate is being harvested by child slaves. Cows are having unholy things done to their bodies in order to be able to live on diets they are not designed to consume…including candy. Chickens are being bred for their breasts, which means their legs can’t support their weight. Eating food out of season and from halfway around the world contributes to our dependence on oil and potentially takes food from famine-ravaged countries. Etc, etc, etc. Overwhelmed? Take a breath. Ok, now take another one. And then repeat after me: I am just one person. I cannot save the world in a day. I am just one person. My favorite: Think Globally. Act Locally. And then, before you find yourself frozen in the Halloween candy aisle of Target vacillating between trying to find the most Conscious Chocolate you can afford that won’t get your house egged vs. just buying the Hershey’s multipack because you’re a sucker for Kit-Kats (true story) take a breath. Realize that, just like with charities, you cannot solve every problem. You can donate to Save the Whales OR Coastal Cleanup, March of Dimes OR the MS Walk. All are worthy, all deserve attention, but trying to cast a very wide net will empty your bank account, fill your calendar, and wear you out. So, as with everything else, you follow your heart and try to do the most good where you can. As with Part One, I’m going to share what this looks like for us. I start by purchasing as locally as possible. I realize that I am lucky: I live in Northern California and can grow virtually anything I want. Farmers’ markets are plentiful, as are CSAs and community gardens. Even if you live somewhere with a short growing season, I’m certain you can find local producers of some of the things you use regularly. The benefits of eating locally have been covered by greater minds than mine, so I’ll just leave it at this: It tastes better. It also is more likely to be organic (even if not certified so), and you’ll be putting your money back into your community. Everything else for me is negotiable — EXCEPT — I cannot buy chocolate or coffee that isn’t Fair Trade certified. I just can’t. I do not, however, get too caught up in whether or not the maker of my son’s favorite cookie treats is owned by a distant parent company that may or may not support Monsanto, or donated money to kill the GMO labeling bill. Some people do (they even have an app for it), but I draw the line at homemade crackers. A very tasty cup of joe. We also have meat as a side dish, rather than the main course, and I am super picky about where it comes from. Again — this is a place where shopping locally helps. A small rancher is going to be able to pay more attention to the healthy and well-being of his flocks and herds — which is going to provide you with healthier meat. Getting to know your provider (again — farmer’s markets and CSAs are really helpful here) can have the added bonus of helping you out with special needs such as allergen cross-contamination, kosher and Halal laws, or just plain making sure that the only bad day your food had was that one at the end. So take a bit of time, have a conversation at the dinner table, and assess where your priorities lie. Then come back and let me know. We can create a collective list of resources to help everyone nourish not just their bodies, but their soul as well. 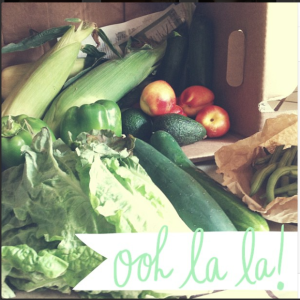 Find a farm, farmers’ market, locally sourced restaurant, or CSA near you at Local Harvest. Information about Slave Free Chocolate. Information about Fair Trade USA. It’s so hard to find the balance between being totally oblivious and then encountering that avalanche of information and atrocity that really can be paralyzing. I think one of my biggest fears about going with the ‘easy’ choice (which I do, often) is that I’ll move back into that realm of oblivious – I want to stick my fingers in my ears and sing LALALA when I drive through a fast food place or grab a non fairtrade coffee/chocolate/sugar etc. 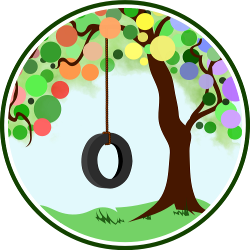 But guilt – while it’s helpful at times – really can’t be the motivator. As much as I truly do need the outrage, I need the family fun of visiting the farm, the incredible taste experience of local produce, the satisfaction of growing a few of my own foods…it’s a stronger foundation both to build and come back to. I like the idea of making meat a side dish – for my family of carnivores it’s almost always the main meal but over the past few years we’ve been sourcing more carefully and finally gotten to the point this year where we’re buying straight from farmers and this fall harvest will have our supply for the next 6 months if nto longer. I would certainly add convenience as a plus to that! Learning how to can, preserve and dry food have also been among my priorities – not always easy to find the time but so worth taking advantage of the low prices of in season produce (in our all too short Canadian growing season!) – and there’s nothing quite so satisfying as eating that stuff in the winter – knowing you did it yourself. I guess in all that I would add to your very wise advice that one person can only do so much to take your time. I get so impatient with myself sometimes as my actions do not keep pace with my knowledge consumption. But then I can look back to 3 years ago and we are so beyond different in our food consumption that it’s almost laughable things could change so much. And yet still that far from being perfect. So I’ll go along with that follow your heart and do what you can mantra, along with a when you can thrown in there. Great post here! I really like the fact about the vegetable oil. HaHa! I agree with you to use vegetable oil. I like coconut oil, too. I use it for almost everything but thanks for all these great tips and making us aware of what goes on with our foods.